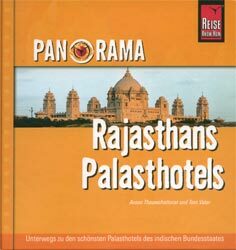 In 2007, Aroon Thaewchatturat’s photo book, Palace Hotels of Rajasthan, was published by Reise Know How Verlag in Germany. Tom Vater wrote the text. The book covers a wide range of heritage hotels with royal connections around Rajasthan, from modest but attractive mansions to gigantic palaces, from pure, sumptuous Raj nostalgia to bottomless kitsch. The book came about after two trips by Aroon Thaewchatturat and Tom Vater around Rajasthan, in 2005 and 2006, for a series of magazine stories on the hotel businesses of India’s splendidly eccentric maharajas. This month’s Traversing the Orient Magazine looks back at some of the most interesting properties we stayed at.